A Linux Survival visitor recently asked me if there are good job opportunities for people with Linux skills. He also wanted to know what salary he could expect and whether Linux professionals have a good future. So I did some research and discovered that the Linux job market is booming. 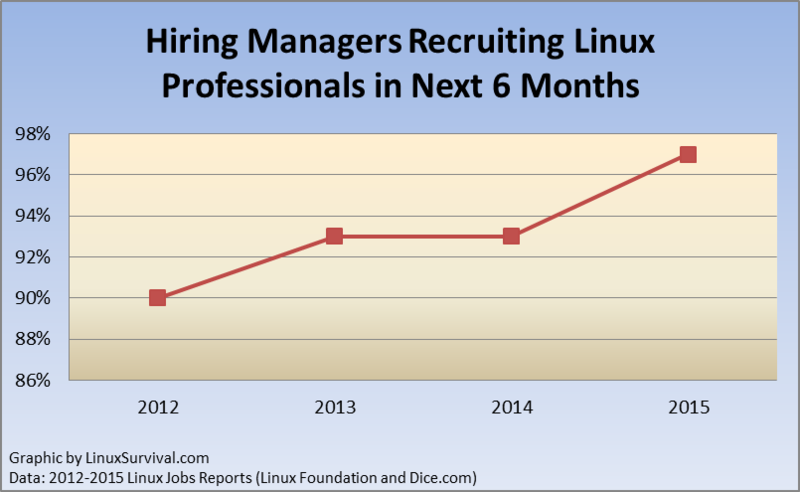 “Nearly all hiring managers are looking to recruit Linux professionals in the next six months,” according to the 2015 Linux Jobs Report. 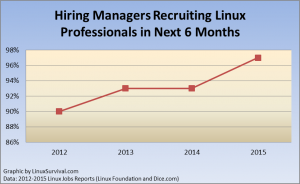 Furthermore, Linux recruiting has been rising steadily, going from 90% in 2012 to 97% in 2015. The recruiting numbers sound promising, but they don’t tell us how many Linux job openings there are. 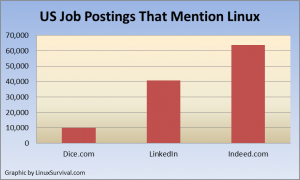 One obvious way to find out is to search the big job boards. When I searched for job postings in the United States that mention Linux, the numbers were so high I thought I had made a mistake. 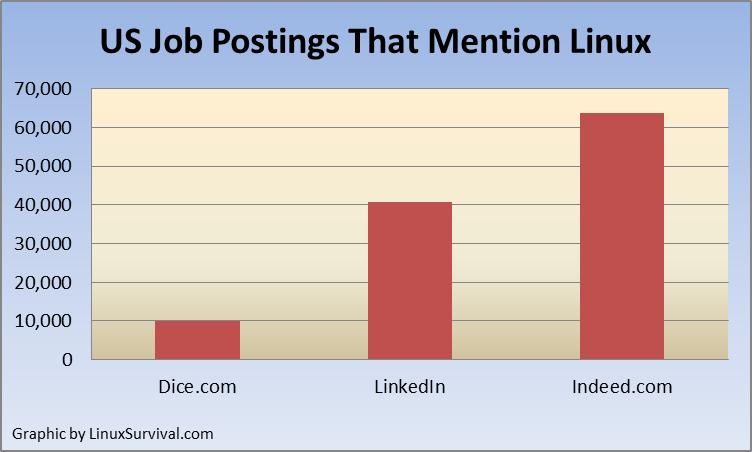 There were 10,021 positions in the US mentioning Linux on Dice.com; 40,684 on LinkedIn; and 63,764 on Indeed.com. The top 10 companies (not including staffing agencies) hiring people with Linux skills on Indeed.com are shown in this chart. This list is full of surprises. 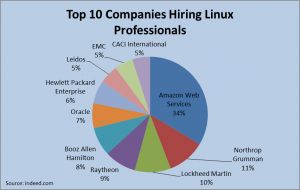 Although it’s not shocking that Amazon needs lots of Linux people, I didn’t expect them to have one-third of all the job postings in the top 10. Amazon has 1,838 Linux-related job openings! Another surprise is that more than half of the companies are in the defense industry. I expected technology companies like Oracle, HP, and EMC to be on the list, but I never would have guessed that defense contractors would be hiring more than all three of them combined. Of course, this could just be an unusually busy time for the defense industry. I’ll check the list again in a few months and let you know. Of these 15 titles, only 3 actually have Linux in their title—Linux Systems Administrator, Linux Administrator, and Linux Engineer. That doesn’t mean the others aren’t really Linux jobs, though. For example, System Administrator is a common title for people who primarily maintain Linux systems. Eight of the 15 titles are administration or architecture jobs and 7 are software development positions, although it’s debatable how to categorize titles like DevOps Engineer and Systems Engineer. 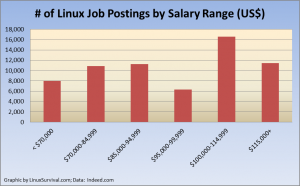 So there are lots of jobs involving Linux, but how much do they pay? I looked for answers in two different ways. First, I checked the Robert Half Technology 2016 Salary Guide. It says systems administrators make $67,500 – $107,500 (a 5.3% increase from 2015). That salary range is for general sysadmins, but if they have Linux skills, then they earn an 8% premium. Software developers make $91,000 – $145,250 (a 6.5% increase from 2015). They don’t earn more for having Linux skills, but considering their already high salary level, I’m sure they’re not complaining. Next, I checked Indeed.com, which gives salary estimates for US job postings. 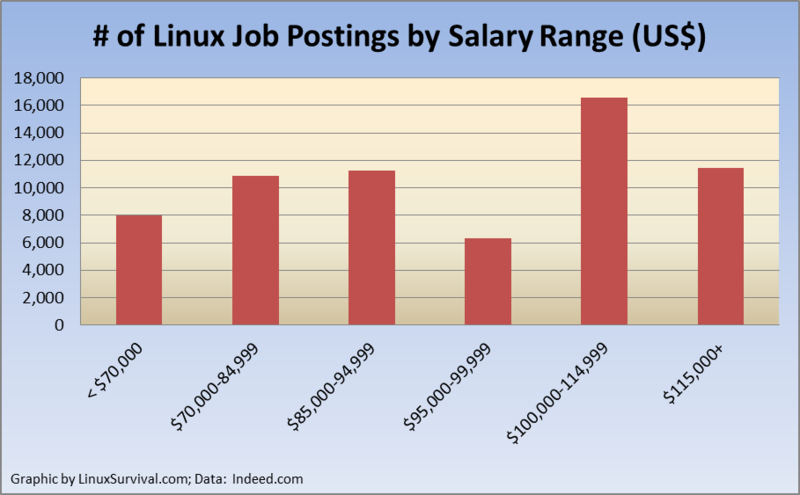 It says that 82% of Linux-related jobs in the US have a salary above $70,000 and 44% have a salary above $100,000. If you’re interested in finding a Linux job in the US, then fill in your city in the form below, and click the “Find Jobs” button. If you’re not in the US, then click on the link for your country. Would you like to know when there is new content on Linux Survival? Subscribe to the mailing list. What other topics would you like to learn more about? Let me know at .